Balancing school and work is a reality for many students throughout the school year. Certain moments are more critical than others in a student’s educational career. The Projet PRÉE targets these moments and uses them to send a clear message to employers and to students: education is the priority! The approaching holiday season places a higher demand on students who are employed while going to school. Indeed, with work schedules extending until late at night and a shortage of manual labour, young people are increasingly called upon by their employers during this holiday marathon. From November 28 to December 4, the Projet PRÉE would like to remind employers, students and parents in the Estrie of the importance of having a healthy balance between studies and work. From the beginning of the school year, it is important to encourage young people as soon as they return to school to adopt strategies to balance school and work. The Projet PRÉE is sending a clear message to employers and students: Education, the priority! From August 22 to September 7, the Projet PRÉE invite you to collaborate and to join with us in this important awareness movement with respect to our young people and their parents. From august 23 to 8 september, a promotional campaign will be broadcast to remember the importance of choosing a certified employer and to give priority to school. As it is already time to head back to classes, it is important to encourage young people as soon as they return to school to adopt strategies that aim to balance school and work. This is why, the Projet PRÉE have chosen this moment to send a clear message to employers and students: Education, a priority! The month of November is a sensitive period for young people who are balancing school and work. At school, the last few weeks before the holiday break are often a period in which schoolwork must be submitted and exams are scheduled. At work, the students may be tempted to make themselves more available in order to satisfy their employers, who often have greater labour needs at this time of the year. This is why the Projet PRÉE has chosen this moment to send a clear message to parents, employers and students: education is the priority! From 7 to 21 september, a promotional campaign will be broadcast to remember the importance of choosing a certified employer and to give priority to school. As it is already time to head back to classes, it is important to encourage young people as soon as they return to school to adopt strategies that aim to balance school and work. This is why, the Projet PRÉE have chosen this moment to send a clear message to employers and students: Education, a priority! The month of December is a sensitive period for young people who are balancing school and work. At school, the last few weeks before the holiday break are often a period in which schoolwork must be submitted and exams are scheduled. At work, the students may be tempted to make themselves more available in order to satisfy their employers, who often have greater labour needs at this time of the year. This is why the Projet PRÉE has chosen this moment to send a clear message to parents, employers and students: education is the priority! 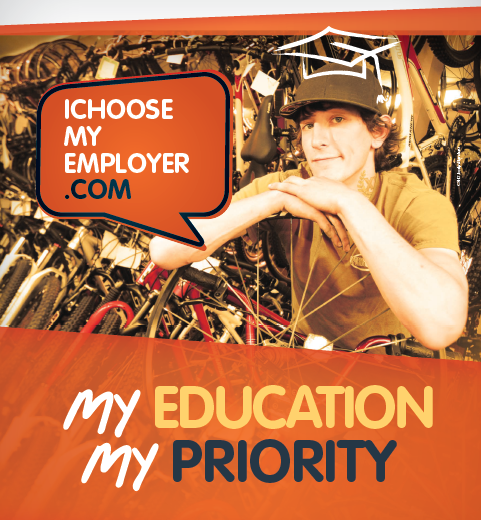 From 23 august to 6 september, a promotional campaign will be broadcast to remember the importance of choosing a certified employer and to give priority to school. As it is already time to head back to classes, it is important to encourage young people as soon as they return to school to adopt strategies that aim to balance school and work. This is why, the Projet PRÉE have chosen this moment to send a clear message to employers and students: Education, a priority! From 22 august to 5 september, a promotional campaign will be broadcast to remember the importance of choosing a certified employer and to give priority to school. As it is already time to head back to classes, it is important to encourage young people as soon as they return to school to adopt strategies that aim to balance school and work. This is why, the Projet PRÉE have chosen this moment to send a clear message to employers and students: Education, a priority!